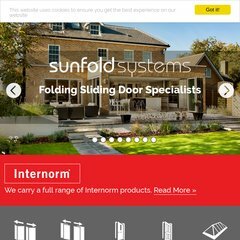 Topics: Sunfold Systems, Technical Download, Folding Sliding Doors, and Interior Doors. The site is programmed for PHP/5.2.6. It is hosted by Daily Internet Ltd Infrastructure (England, Derby,) using Apache web server. Its 2 nameservers are ns1.daily.co.uk, and ns2.daily.co.uk.